Photos and video of oil tankers and shipping containers blocking a bridge between Venezuela and Colombia were used as proof Caracas was “blocking” US aid. Left out was the fact that the bridge was never open for traffic. The bridge figured prominently in last week’s push by official Washington to paint the elected government of Venezuela as hostile to the people, and build support for the US-backed self-proclaimed president Juan Guaido. A USAID convoy arrived in Colombia on Friday, but media outlets reported that the government of President Nicolas Maduro had “blocked” it by setting up fencing and obstacles on the Tienditas International Bridge. The fact-checkers in mainstream media that comb through every word spoken by US President Donald Trump and his cabinet officials stayed silent on Pompeo’s claim. 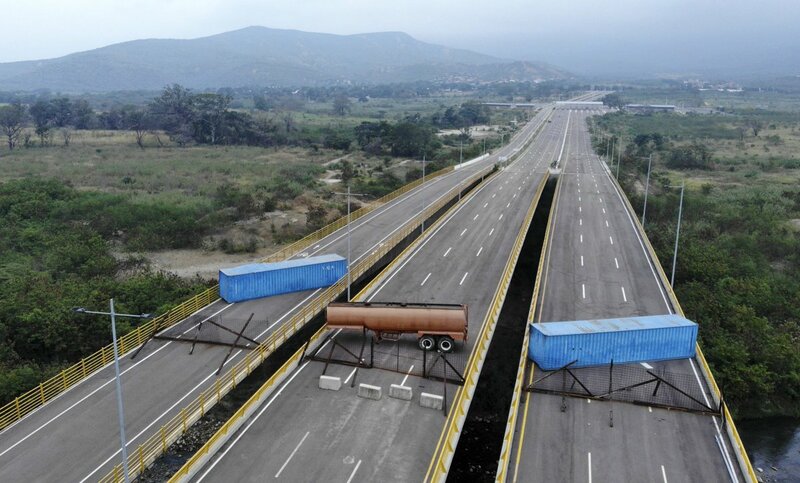 It was left to independent journalists and observers to reveal that, while the containers may have been placed by the Venezuelan government, the bridge was already blocked from the Colombian side. In fact, a cursory search online reveals that the bridge had never actually been open for traffic. The bridge was intended to connect Cucuta in Colombia to Ureña in Venezuela, spanning the Tachira river. According to local media, construction work on it was finalized in early 2016. By that time, however, Colombia had cracked down on its border with Venezuela due to the exodus of up to four million Venezuelans claiming economic hardship and famine in their homeland. Photos from 2017 show the fencing and concrete slabs blocking the bridge on the Colombian side, as blogger Justin Emery pointed out on Medium. There are two other bridges linking Colombia to Venezuela in the same area, both named after heroes of the 1800s struggle for independence from colonial Spain: Simón Bolívar and Francisco de Paula Santander. Though Venezuelan border guards are not allowing the USAID vehicles in, both bridges remain open to cross-border traffic. So why would the US government and most Western media outlets claim the aid is blocked by showing photos of the never-operational Tienditas bridge? Writing at FAIR, Adam Johnson argued the whole affair was a “transparent, cynical PR strategy to delegitimize a Latin American government” the US is trying to overthrow. Johnson pointed out that Elliott Abrams, the State Department’s special envoy for “freedom and democracy” in Venezuela, has a history of abusing humanitarian aid for shipments of weapons to US-backed militants in Latin America. There is no denying that the objective of US officials running the Venezuela policy is regime change in Caracas. The preferred method of doing so appears to be persuading the people of Venezuela – or better yet, the military – to turn away from Maduro and back Guaido. National Security Advisor John Bolton has tried a variety of psychological operations to that effect, from the “5,000 [US] troops to Colombia”notepad scribble to claims that high-ranking Venezuelan officers were in talks with Guaido. Senator Marco Rubio (R-Florida) has been singing from the same hymnbook, though not without getting a ribbing online. Meanwhile, Secretary of State Mike Pompeo has been trying to sell the intervention to the American people and US allies overseas, going so far as to call Guaido “duly elected” (he wasn’t) and even claim that the Lebanon-based Hezbollah was operating in Venezuela. Pompeo seems to have been more successful in his endeavor than Bolton and Rubio: aside from a handful of anti-war Democrats, there is very little criticism inside the US of the official policy in Venezuela. Meanwhile, almost three weeks since the US recognized Guaido as president, Maduro is still standing and the military has not abandoned him.